Turkey has brushed off a Sunday threat by President Trump to "devastate" them economically if they attack the Kurdish militia (YPG) in northern Syria, which US forces have fought alongside against the Islamic State (IS). Turkey regards the YPG as terrorists. "You cannot get anywhere by threatening Turkey economically," said Turkish Foreign Minister Mevlüt Çavuşoğlu. Trump announced in December that the US would withdraw all troops from Syria as the Islamic State had been "defeated," a move which shocked allies and resulted in the resignation of Defense Secretary Jim Mattis. Concerns remain that Kurds from the Syrian Democratic Forces (SDF), which are are under YPG leadership, would fall under attack by Turkey once the US withdraws. 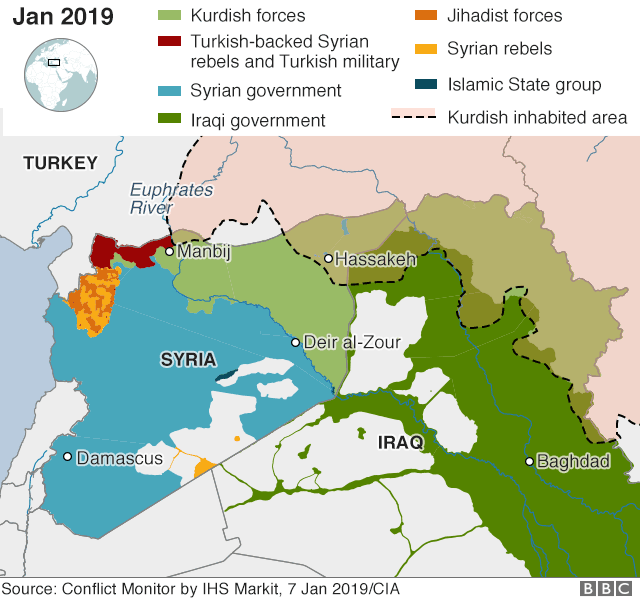 The warning to Turkey came as Ankara has mustered military forces, including tank regiments, along the Syrian border and deep in Afrin after last year's 'Operation Olive Branch' plunged pro-Turkish forces across the border inside Syrian Kurdish enclaves. Last week Turkey's leaders, including the defense minister, described preparations underway for another major Turkish assault on US-backed Kurdish positions east of the Euphrates, following the exit of American advisers based on Trump's previously announced pullout. That said, Trump said on Sunday that he would thwart any Turkish invasion plans with a "20 mile safe zone,"
Presumably this "safe zone" will be towards protecting American forces while precise exit logistics take shape, and will occur simultaneously to the US pounding remnant ISIS positions; however the details remain uncertain. Trump followed his tweet with another repeat promise to "stop the endless wars!" — in what appears a further sign he's currently in a fight with the deep state and hawks within his own administration over Syria policy. Could the US really hurt Turkey's economy? Ankara has rebuffed Trump's threats, with Çavuşoğlu saying: "We have said multiple times that we will not fear or be deterred by any threat," and that "Strategic alliances should not be discussed over Twitter or social media." That said, previous US sanctions have hurt Turkey in the past. In August, the Trump administration slapped Turkey with sanctions and trade tariffs while a US pastor was detained, which caused the Lira to fall precipitously. Two months later, Pastor Andrew Brunson was released. Turkish President Recep Tayyip Erdogan, meanwhile, said through a spokesman that he expected the US to "honor our strategic partnership," adding "Terrorists can't be your partners and allies." Over the weekend, before Mr Trump's latest tweets, Mr Pompeo said he had spoken to Mr Cavusoglu by phone and was "optimistic" that an agreement could be reached with Turkey to protect Kurdish fighters. Mr Pompeo said the US recognised "the Turkish people's right and Mr Erdogan's right to defend their country from terrorists". There are currently around 2,000 US military personnel deployed in northern Syria, which first arrived in autumn 2015 when former President Obama sent in small teams of special forces to train and advise YPG fighters. The move came after several failed attempts at arming and training Syrian Arab rebel groups to battle IS militants. In the ensuing years, the number of US troops in Syria sharply increased - while a network of airfields and bases have been established in an arc across the northeastern region of the country.